1 Where are the videos? I could upload my copies to YouTube, but do not want to have my account blocked for "copyright violation". Was vaiting for someone else to upload. The videos from inside are available. Seems that they contained several original videos in one upload. It must be noted the original poster of these 39 short videos wanted them removed, for reasons we can only guess at. But perhaps to his chagrin and worry, all were saved in many places already - entered into the record. As we have this page helping to preserve that, I've been thinking I should offer this to "take the heat off" Mr. Cherkasov. And this is based on a good guess what the problem was (discussed above). ... a crowd of young men in masks and wooden sticks in their hands knocked out one of the side doors and entered the building. Next record has been going on inside the building. 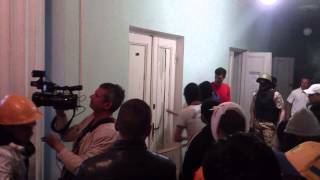 Militants spread all corridor - someone goes to the second floor, one begins to break in the door, behind which, apparently tried to hide Antimaydana activists. Brutal thugs literally pounce on the locked shutters. In the frame comes a woman who begs radicals stop. Frames on the record shows that some of the participants of the storm House of Trade Unions have masks. And it is possible that the assumptions of the poisoning victims Ukrainian radicals toxic substances far from the truth. It was apparently this publicity that spurred their swift removal. However, now that I've reviewed the bulk of available videos (that I can find) these views are not that crucial in the important sense of proving an incursion. Several other videos show dozens of armed Maidan thugs - all kinds, including some women - entering by this and another door (see here). They do not appear particularly enraged, just energized, as they enter with clubs and the like, suggesting violent intent. We can't see who among these, or among other less visible assailants, might have started which internal fire, busted open which activist's head, shot, raped, or poison-gassed exactly who. But even without a single inside view, or full proof of the crimes committed, we can be fairly sure, whatever was done, which side the perpetrators were on. What is unique is that there was filming inside, and it was released. Others recorded the events - like this guy nearby with a nice camera. But his video and any others made were not released publicly - maybe held back for Right Sector recruitment videos? Only these three that appeared offered even a partial view actually from inside. But then, this view is not amazing ; it shows just one corner of the ground floor and lower stairwell. It might be that cameras weren't allowed any further in, if even here (no one moves to stop the filming, that we see). That he didn't know the "don't release the videos" rule might mean Cherkasov is not a Right Sector insider, perhaps limiting his access. But then again, this narrow view does show the mob smashing in doors to get at the people locked inside - and it does show "Flagneck" inside, perhaps starting the stairwell fire we see emerging just ahead of him and his group (described here. The very fact that these key features can both be seen in this small area, unless this was the uniquely violent corner, suggests many other corners suffered the same types of thing, or worse - away from uncontrolled cameras. This page was last edited on 11 October 2014, at 08:25.